Hanne Darboven is recognised for her ambitious and idiosyncratic body of work that operates at the limits of representation. Sprüth Magers presents the first solo show of her work on the West Coast since 2010 – exhibiting three of her monumental installations that knit together mathematical procedure, historical and cultural artefact, and autobiographical documentation in an attempt to record subjective and objective perceptions of time via a conceptually coherent visual system. Darboven’s unwavering dedication to the representation of time began in earnest in the late 1960s after a stint in New York where she met artists Joseph Kosuth, Carl Andre and Sol LeWitt. Upon returning to her native Hamburg, she developed a formula for date calculations that would go on to structure her subsequent time-based works. Darboven’s early mathematical calendars were arranged in gargantuan wall installations that sought to quantify time in space. She explained her mathematical interpretation of time as a stance against social or political co-optation: unlike words, numbers refer to nothing beyond themselves, and it was this sovereignty that was so appealing. She described her methodology as “writing without describing”, and transcribing the passage of time became a meditative process that she applied herself to with the regularity of office labour. Towards the end of the 1970s, Darboven began to punctuate her numerical tableaux with a variety of materials that grappled with themes such as the Enlightenment, mass media, technological progress, religion, politics, and the arts. Her use of photographs, postcards, objects from her studio, and quotations of texts ranging from Classical philosophy to the Frankfurt School, marked a shift in her practice from the abstract documentation of time toward a narrative interweaving of cultural and personal history. Erdkunde I, II,III (Geography I, II, III) (1986) dominates the main gallery. It consists of over seven hundred wall-hanging panels, each comprising four collaged sheets of calendar pages, articles, drawings and photographs, as well as ten free-standing wooden classroom displays. 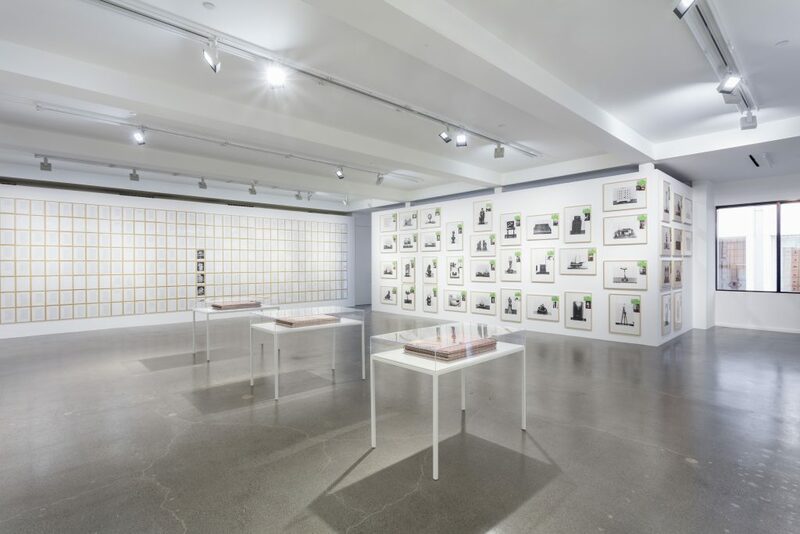 The composition is divided into three parts that are structured by indices; the index panels of the first part of the installation present black and white photographs of Darboven’s Hamburg studio. Visible within the photographs are rolled and unrolled educational maps, an array of objects from her studio, and a bust of Alexander von Humboldt – the eighteenth century pioneer of empirical geography. Further index pages include transcriptions from the Brockhaus Encyclopaedia derived from the entries for Erde (the Earth) and Erdkunde(Geography). The work also contains installation shots of Darboven’s exhibition, Cultural History 1880–1983 (1980–83), at the Musée de la Ville de Paris (1985), as well as collaged notes on the work’s structure, and folkloric illustrations of global technological achievements that are fixed to the display boards. Erdkunde I, II,III (Geography I, II, III) fuses diverse methods of ordering and documenting the world in which Darboven intersperses encyclopaedic didacticism with autobiographical detail. It can be understood as her subjective reflection on the sublime human endeavour to summarise the totality of knowledge, and the scope of her labour involved in such an undertaking. 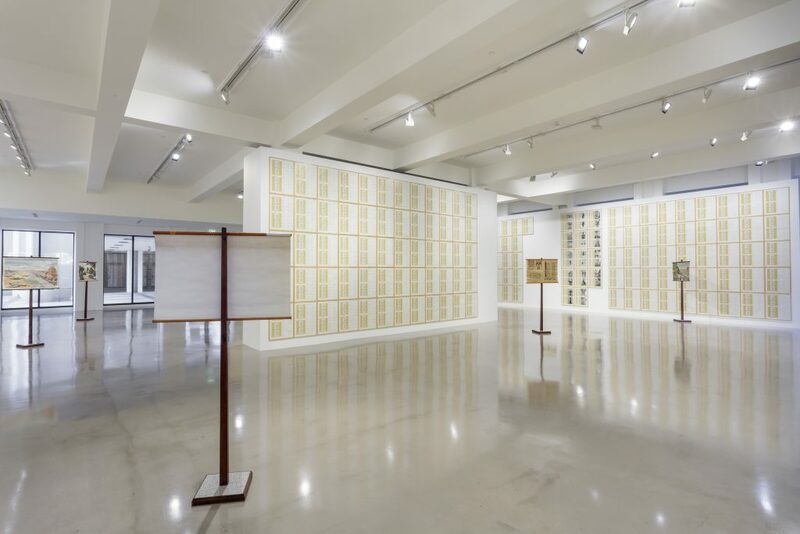 Upstairs, Leben, leben / Life, living (1997/98) is an immense installation of over one thousand four hundred framed works that form part of Darboven’s systematic indexing of the years 1900 – 1999. It utilises the mathematical representation of history developed early in her practice; calculations are conveyed in type, ball-point and felt-tip pen. 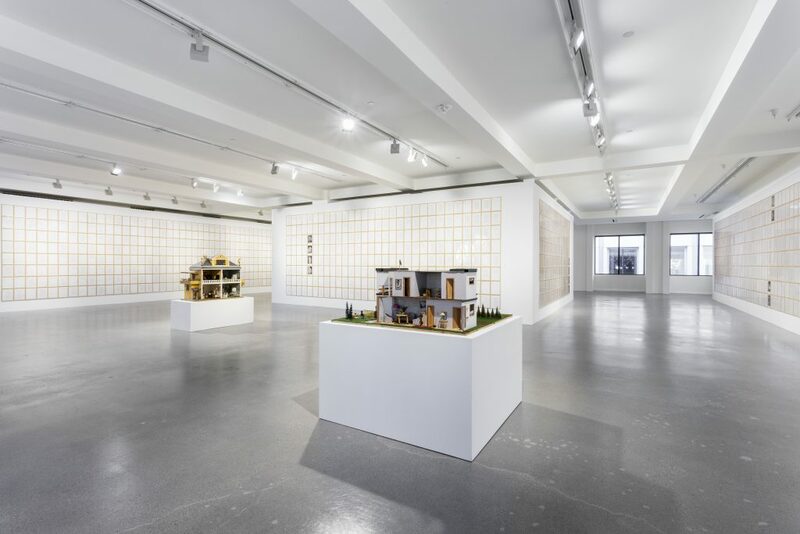 It also features photographs of dollhouses, and two dollhouses from Darboven’s personal collection are physically presented in the gallery space. The first represents a typical German home from the 19th century, and the second is a home from the 1950s. Leben, leben / Life, living represents time, first and foremost, as the very specific historical period that the work spans. 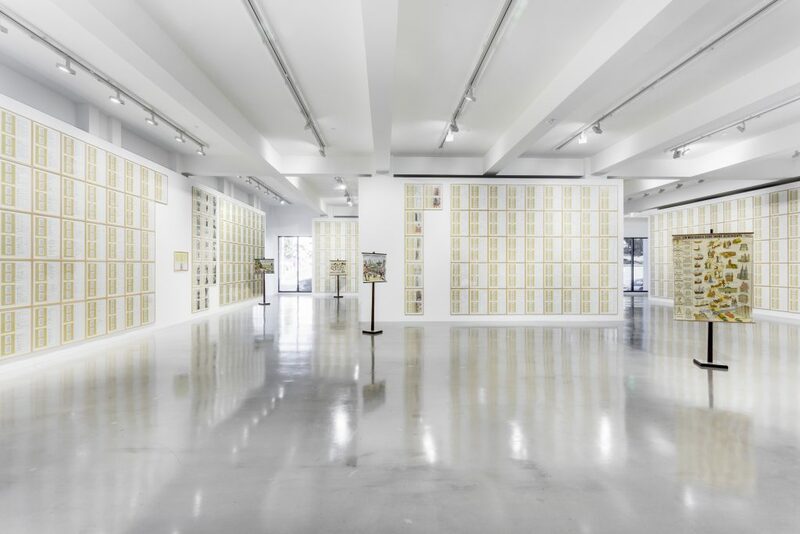 Yet, the overwhelming volume of the installation equally acknowledges the unrelenting pace of Darboven’s own labour. Fin de Siècle – Buch der Bilder (Fin de Siècle – Book of Pictures) (1992/93) is assembled from over five hundred work sheets, forty-two panels and fifty-four albums. On the wall, the framed sheets combine date calculations with reproductions of her earlier work, Bilddokumentation (1978). These postcards display various objects from her studio such as a telescope, magnifying glass, clock and globe. Each object is classified with written labels that translate as “technological development”, “intellectual development” and “history”. 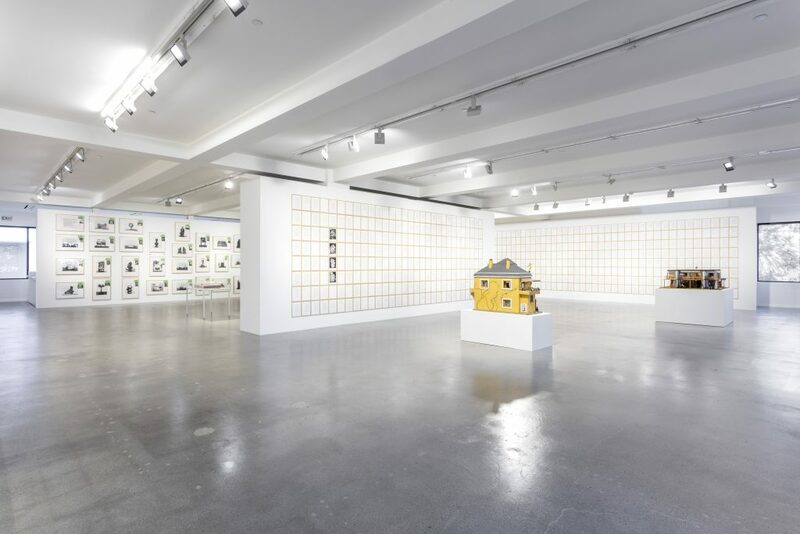 Green postcards recur throughout the installation; these were designed by Darboven complete with a stamp that refers to her studio home, Burgberg, and were often sent out to family and friends or incorporated into artworks. The albums housed in the vitrines feature photographs of Darboven’s notebooks, date calculations, and excerpts from their transliteration into a musical score. By collating numerous artefacts that chart technological and intellectual human achievement, whilst simultaneously referencing her own historical artistic practice, Darboven usesFin de Siècle – Buch der Bilder (Fin de Siècle – Book of Pictures) to interweave her personal history within a wider narrative of human progress.